As we run through winter, Muskoka Algonquin Runners is excited to announce that it is returning to Craftsbury Outdoor Center in the summer of 2014. This opportunity is open to runners in or entering high school in 2014. 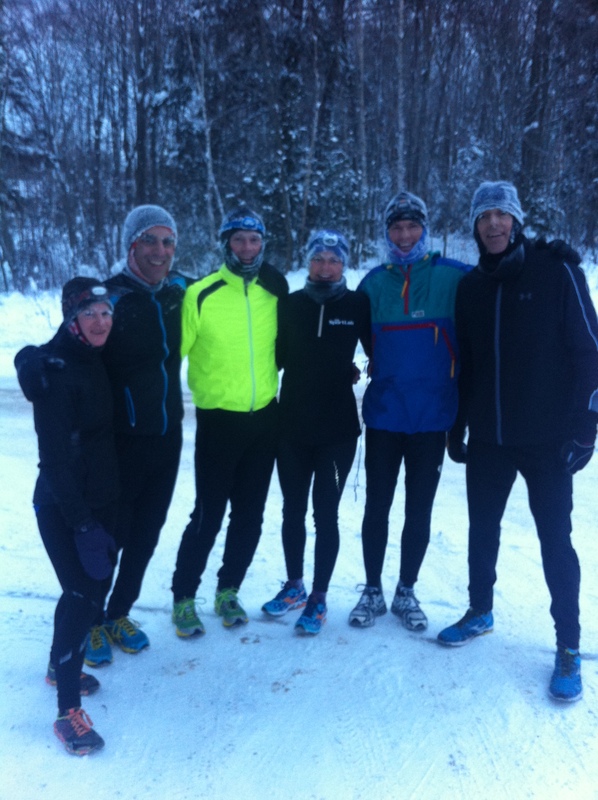 Last year MARS took 11 runners to The Craftsbury Outdoor Center in Craftsbury, Vermont. Along with 20 other high school runners (31 total) from the U.S.A., they were coached by Olympic bronze medallist and three time World Cross Country Champion, Lynn Jennings, in addition to two NCAA coaches and 2 NCAA athletes. It was an incredible experience, not to mention, an incredible camp setting in northern Vermont. Last year the camp filled before we were able to fill our two vans (12 runners) and we want to make sure that young runners who wish to go do not miss out. This opportunity to travel is offered by MARS and not by the high school. This opportunity is open to runners of all abilities. MARS is returning to Craftsbury in 2014. This year the camp is offering two separate 1 week sessions for high schoolers. We will be going to the June 29-July 5 camp (and will depart Huntsville the morning of June 28). They are decreasing the capacity from 31 to 25 so we expect the camp to fill up quickly. Last year there were 8 coaches for 31 runners! So far 5 local runners are registered to go with room for 7 more, assuming there remains space at the camp. The cost of the camp in 2014 is $630 US plus our travel expenses which we hope to contain below $250 (last year $175 with fundraising). In addition you must be a Muskoka Algonquin Runners member (basic membership $20) to attend for insurance reasons. The camp provides supervision for the kids upon arrival and there would be two adults traveling with the group like last year. Interested families can book accomodations at the Center as it is not just a camp but an Outdoor Center. Visit www.craftsbury.com for details. For those interested in an option closer to home, Camp Olympia offers a cross country running camp August 17-23. 1. Go to www.craftsbury.com and register for the June 29-July 5 camp. 2. Email pmikhail@me.com to reserve a spot in the vans. 3. Call Craftsbury to give them your deposit (last year $250) to confirm your reservation. 4. In the new year, get/renew your Muskoka Algonquin Runners membership ($20 for basic membership) which also allows you to go to any MARS training sessions all year and particularly in summer. 5. In the new year more details including any fundraising, will follow. Runners will require a valid passport, out of country health insurance, medical clearance letter from their doctor and a permission for travel letter. The travel letters will be provided at no cost by Derek Miller and Associates. Please email pmikhail@me.com if you have any questions about this. 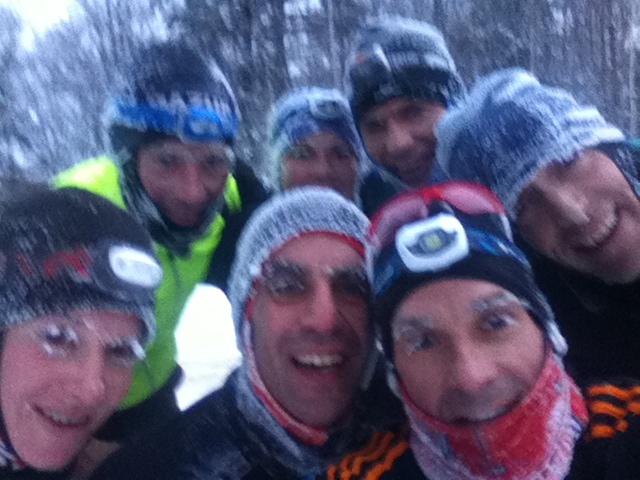 Happy Holiday from Muskoka Algonquin Runners! 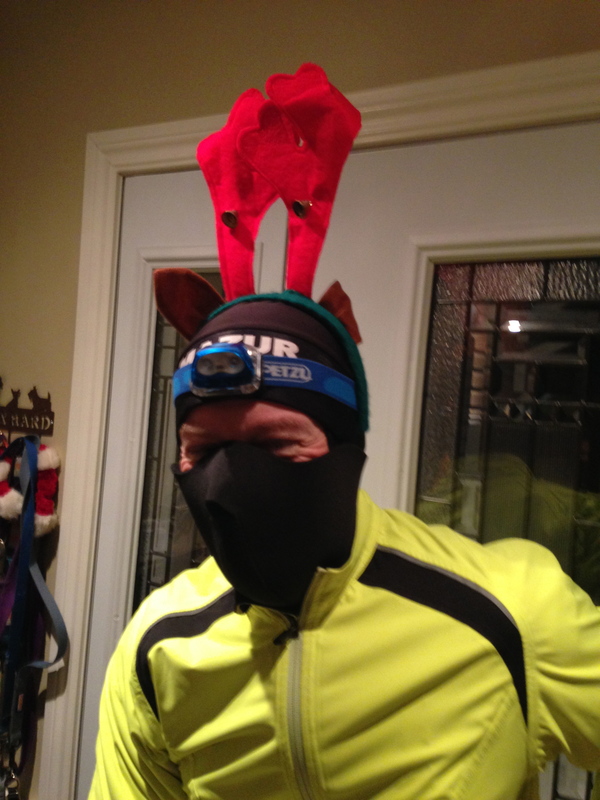 Thursday December 26, 90 minute run at 7:30 am, starting at 106 Phillips Crescent. Tuesday December 31 resume normal schedule. Please note: Beginning December 31 the meeting place for Tuesday morning runs will be Huntsville High School parking lot, as the town is not clearing the Conroy parking area. Finally, mark your calendars as the next Run To The Pub event will happen Thursday January 23, 2014. Meet 4:30 pm River Mill Park to run, and 5:30 pm at the pub. Beginning in January, only club members will be welcome. Membership information available at Membership tab at this website. Happy Holidays and see you on the roads. Muskoka Algonquin Runners is excited to announce that membership renewals are now available at our Membership tab. Download one of three membership forms (outlined at page), complete the form and go to The Sportlab to pay. We have kept our fees at the same rate as last year, which is the relevant Athletics Ontario fee plus $5. This means the least expensive membership is a bargain at $20 per year. Those runners who will be running in Athletics Ontario races (cross country and track) will need to purchase a Competitive or Masters membership. It is possible to upgrade a membership part way through the year. Memberships cost the same regardless of when you join so there is no benefit to waiting (Athletics Ontario does not pro-rate membership fees for part years). MARS would also like to thank The Sportlab (Lowell Greib and Katherine Ahokas) and Pharmasave (Troy Cox) for sponsoring Muskoka Algonquin Runners in 2014. We are fortunate to have community business support of running. MARS will be offering new (optional) fancy gear for 2014 made by Champion Systems. The gear is available for purchase when you complete your membership form. There will likely be an opportunity to put in a future order as well if there is interest (requires order of 10+). The Standard Gear package consists of a high quality Tech Shirt and Socks for $60. The MARS Team Kit consists of a Tech Shirt, Racing Singlet, Training Jacket and Socks for $195. Pictures of the new gear will be posted on the BLING tab of our website in the next week and will be available as samples at The Sportlab in the near future. 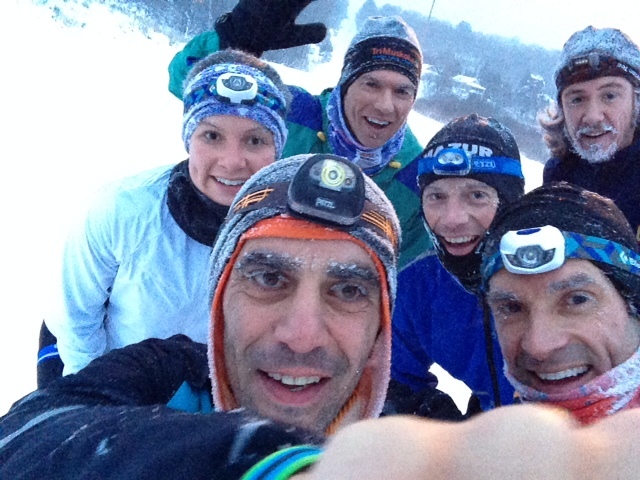 Several crazy runners braved the weather Tuesday morning for a stride workout. The next organized run is Thursday at noon from Highway 60 Tim Horton’s for a long run. The first mile will be a social mile. The details of meeting place for Saturday 6:30 am run will be posted on our Calendar tab by Friday evening. The next run in the Orillia Snowflake Series is this Sunday December 15. Details here. The next Run To The Pub event is Thursday December 19 at 4:30 pm at River Mill Park for a run and 5:30 pm at On The Docks Pub. 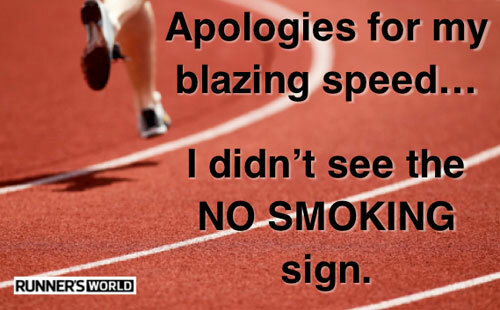 Come for either but bring headlamps if you are running! Non club members are welcome to join us and learn more about the club. See you on the roads and perhaps under the snow! 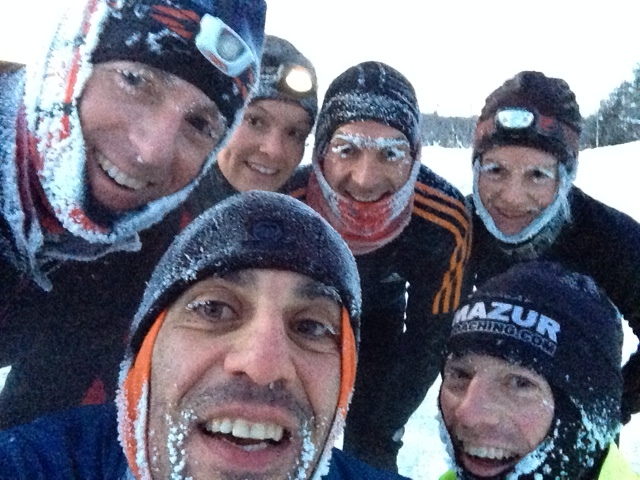 Winter is here and the MARS winter running program is starting this week. There is lots going on. We welcome members of all abilities to join us. On Tuesday there will be 6:30 am stride workout, meeting at Conroy Track. On Thursday at noon, we will head out for a long run, departing from the Tim Horton’s on Highway 60. The first mile will be a social mile. 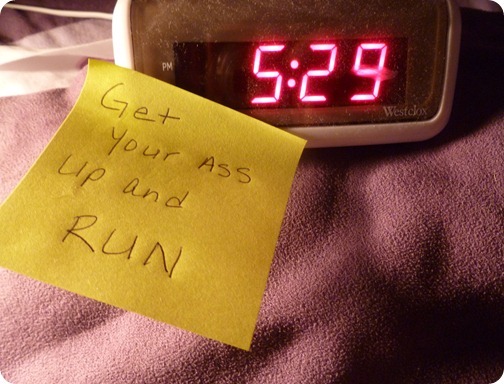 Saturday morning at 6:30 am we will do a Steady State Run. Location TBA and will be posted on calendar. In addition, race 2 of the Orillia Snowflake Series is December 15. Details can be found here. The Sunday Morning Running Group in Huntsville, Ontario continues to meet every Sunday at 9 am. Details at their Facebook Page. Registration for our road trip marathon in Vermont is open. Why not take a chance and join our road trip? If you prefer to run less, the Relay Marathon (2-5 member teams) registration opens February 1, 2014. Details can be found here. We will depart May 23 and return May 25. The Masters Indoor Track series begins January 2014. For those of you who hate running outdoors in winter, why not try one of these races? Details can be found here. More details on MARS carpool to some of these races to follow. Memberships renewals will begin soon. Memberships and gear will be available through The Sportlab. Registration forms will be available for download from the Membership tab of our website in the next week. Our gear is optional but will be greatly improved this year. Gear options will be available with registration. MARS is returning to Craftsbury Outdoor Center’s High School Running Camp June 29-July 5. The club will depart on June 28 with two vans filled with teenagers. 25 high schoolers from around North America will head to Craftsbury to be coached by Olympic Bronze Medalist and Three Time World Cross Country Champion, Lynn Jennings. In addition to the fantastic running opportunity, this is a gorgeous camp and a great camp experience for teenagers. Details about the camp can be found here. You can also contact us through the Contact tab at our website for more details. Finally, our next Run To The Pub event will happen Thursday December 19 at 4:30 pm (River Mill Park) for a run and 5:30 pm at On The Docks Pub for good cheer. See you there. Non members are welcome to try us out that day.